If you garden, it is likely you have plenty of old plastic pots lying around. Seedlings from the nursery come in them, and they are economical enough that it is easy to amass a large collection. Don't toss them or let them take up space in the garage, bring them inside and create craft gifts for family and friends. 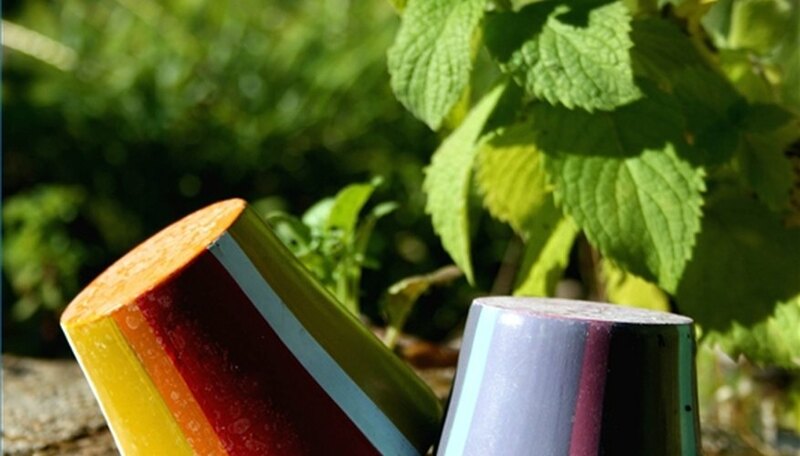 Most flower pot crafts are easy enough for the kids to help with, too. Make a functional flower garden pen holder. Prepare the pens by placing the stem of a fake flower against one with the bloom on the end of the pen. Wrap the stem and pen with green florist's tape until it is completely covered, except for the writing tip. Make four or more pens. Spray paint your plastic flower pot a single color and let dry. Paint a design or your name on the side of the pot using paint pens or acrylic paint. Glue embellishments, such as beads, rhinestones or paper designs, onto the side if desired. Tape over the holes on the bottom of the pot and then fill it with gravel. Stick the flower pens into it to finish the display. Clean a small plastic pot and paint it a bright color. Glue brightly colored plastic buttons around the rim. Place a square of florist's foam into the bottom of the pot then stick lollipops into the foam. Cover the foam base with green shredded paper. Make a larger version with a big plastic pot. Instead of lollipops, prepare your favorite cookie recipe. Stick wooden skewers into the dough before baking. After the cookies cool, wrap in colored cellophane and tie a ribbon around the stem to secure. Push the cookies on their sticks into the florist's foam and cover. Make a bunny pot for Easter goodies or as a year-round candy dish. Paint the plastic pot white. Cut two bunny ears out of white craft foam, and smaller pink ovals to go inside the ears. Glue these to the back of the pot so they protrude over the rim. Glue a black pom-pom to the center front, and glue two larger pink pom-poms under it to make the nose and cheeks. Glue googly eyes above the nose. Cut three pieces of white pipe cleaner in half. Glue three on each side of the nose for the whiskers. Make different animals by using different embellishments. Paint the pot brown and attach large foam ears to make a monkey, or glue ears to the side and make a puppy pot.